Force Field Analysis: Kurt Lewin created a powerful strategic tool used to understand what’s needed for change in both business and personal environments. I have used it many times in both situations. The first necessary step in undertaking a force field analysis is to define both the present state of affairs on whatever the issue, as well as the desired future state. You want to make both statements as precise as possible. This is quite tough to do, especially getting to an agreement on what can be agreed as the end objective of the matter in question. Next comes the fun part. List all the forces that may be getting in the way of the desired future state and after that, all the forces that may be helping you reach the desired future state. I suggest that you start with the negative things, simply because they come more readily to mind than the positive ones. When you have produced the two lists, you may find that the same forces appear in both lists; don’t let that deter you, though when you look at both lists, you may want to deal with any redundancies or overlaps. Occasionally the same force can be both a driving and a restraining force, with slightly different emphases. 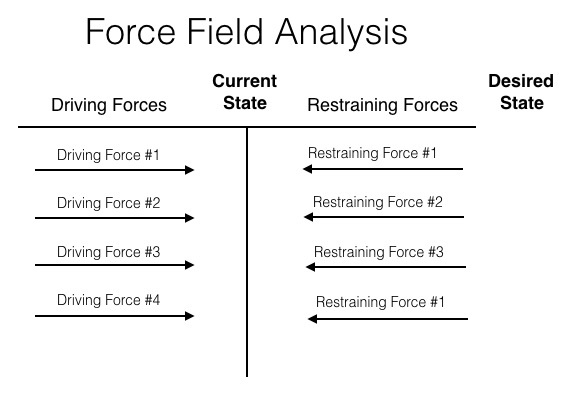 With your edited lists ready, draw a force field diagram similar to the one on the right, but with the states and forces named. Obvious the purpose of force field analysis is to push towards the desired state of affairs. It’s almost as though you will be pushing the vertical line to the right. Next, work on the restraining forces first, and particularly focus on the ones that can be simply kicked out of the way by simple or inexpensive means. With the more intractable ones remaining, the list will seem less daunting and will become more manageable. Amplifying the driving forces is trickier, simply because the decisions may involve cost, that could itself become a restraining force, so you may need to do the exercise iteratively. Now, when the force field diagram is edited, you can start to set action priorities. You may want to use the Affinity Diagram to get a sense of which forces are the most urgent to tackle. My own experience may be instructive. At first the process seemed cumbersome, but the more I used it both alone and with others, the more effective and useful it became. I even used it to help someone to decide whether to buy an apartment, and later I even used it to help a friend to decide whether or not to propose marriage! Force Field Analysis may sound to you like a subject for a physics class, but it’s a simple and fun process. Use Brainstorming to help you. You will probably find that you come up with more restraining forces than driving forces, at the beginning. That’s natural because our brains have a negative bias. Don’t be bothered by that; when you get to the second step of the force field analysis, you’ll also find the negatives easier to kick out of the way!